Beautiful weather, the best for ages, as we tried another new site. Gunho in Guisbrough, near Middlesbrough. It’s a site I’ve been trying to get to for ages as it’s so close and eventually all (both!) the Raptors made it. They’ve got a a great location, laid back from a main road by a couple hundred yards it’s nicely out of the way. No neighbours to disturb and plenty of space. So after the usual tarting about, sorting kit in the car park they eventually assembled a good crowd of about 40 including lots of 1st timers. These were fairly easy to spot for the bright hoodies and flourescent trainers. The safety brief I’m afraid to say was dire (really bad, the worst I have ever been at). There was some mumbling about taking hits and keeping eye protection on and that “fps for bolt actions was high”. Nothing about safe zones, or how to clear a gun, the marshal even had a safety brief sheet to read from which he ignored… Now I know that experienced players shouldn’t really need telling, but for the young newbies there (and there were lots), in their best hoodies, faced with rows of guys in full camo, tactical gear and fancy weapons they really needed a good loud authoritative and above all comprehensive safety brief. Not a great start. 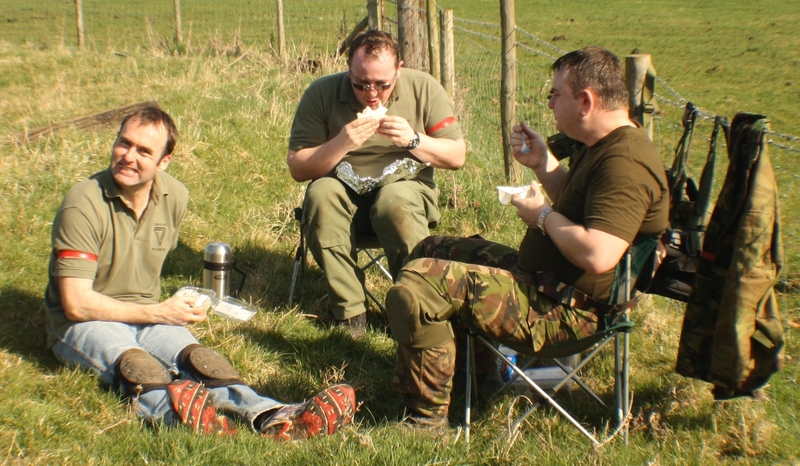 The day developed into some scenario games based on moving, capturing or discovering a bomb (shiny blue metal case) and getting it to the enemy base. The first of which gave us a run round the far end of the site. At this point you discover the sites best aspects, beautiful old untouched woodland. Fantastic even at this time of year with cover, some undulations to creep about it, and plenty of hiding spots. As we regrouped at our base having first grabbed the bomb we made a concerted move to get to the opfor base. I went scouting ahead for out bomb carrier, clearing a path, and pulled off what can only be described as an awesome shot, a one shot kill, on a target moving between cover some distance ahead. Only marginally reduced in it’s awesomeness by the realisation that he was on our team… With time running out fast we launched a co-ordinate attack on the enemy base as they cowered inside, falling short by some 20m as time ran out. A moral victory none the less. Next, organising games. Medic rules are great, and need bleed out options for when a medic isn’t coming. But simply dumping a dozen players immediately in the rear of a team that has just cleared and checked it’s rear really isn’t sporting. It’s bloody annoying. The only way to finish the day appropriately was to bask in the glow of the beautiful evening sun and our victories at the pub down the road. All in all a good days airsoft. Enjoyed the day, great to see the lads out, and some fellow airsofters we hadn’t seen in a while – Definitely coming back, but would think about timing next visit when only airsoft is on.